↑ J. L. Tonry (2001). "The SBF Survey of Galaxy Distances. IV. SBF Magnitudes, Colors, and Distances". Astrophysical Journal 546 (2): 681–693. doi:10.1086/318301. Bibcode: 2001ApJ...546..681T. ↑ ၉.၀ ၉.၁ F. P. Israel (1998). 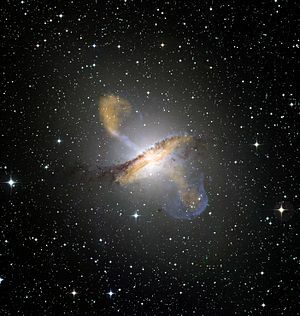 "Centaurus A – NGC 5128". Astronomy and Astrophysics Review 8 (4): 237–278. doi:10.1007/s001590050011. Bibcode: 1998A&ARv...8..237I. ↑ "Spitzer Observations of the Dusty Warped Disk of Centaurus A" (2006). The Astrophysical Journal 645 (2): 1092. doi:10.1086/504418. Bibcode: 2006ApJ...645.1092Q.